Miller, Calvin. 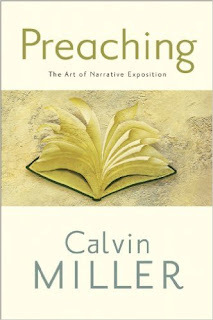 Preaching: The Art of Narrative Exposition. Grand Rapids: Baker Books, 2006. As the title suggests, Miller's book emphasizes the importance of storytelling in preaching. Below are some of my favourite quotes from the book. ...nobody knows better than those who preach that preaching is an art in which a studied, professional sinner tells the less studied sinners how they ought to believe, behave, and serve. Fortunately the office of “preacher” carries with it a common understanding that as long as the preacher speaks for God, he should be heard even if he is a sinner (p. 9). To get the job done preaching must be committed to two goals: first it should be passionate and second, fascinating (p. 12). Passion can never be genuine unless the preacher owns a burning need for a God-relationship. Zeal must own the herald before the herald can preach it into others (p. 16). Great expositors succeed precisely because they refuse to trade honest exposition for congregational popularity. They have never been intrigued by the wonder of becoming mega influences by preaching minisermons (p. 27). It is easy to catch the tone of two ideas here. First the word pastor is the most appropriate name for the preacher. Shepherding takes into account a whole range of compassionate skills that belong to the pastor. Shepherds guard, heal, tend, and maybe even shear, when the care of the sheep require it. But of all these activities nothing is more critical than feeding them homiletically. A second idea inherent in the word pastor is the act of “knowing” them. Jesus makes so much of this idea in John 10. He said that his sheep knew him and he knew them. Who knows all the applications that might be made of this idea, but one thing must be said: we can only preach to them— really preach to them— if we know who they are, the burdens they carry, where they work, and the heaviness of life that has gathered about them (pp. 37-38). The difference between a dull lecturer and a glorious preacher is all in the application (p. 50). Is the sermon about Christ? Is the sermon about the Bible? Is the sermon about them (the listeners) and the present moment? The sermon must arrive at the listener’s hearing through a channel of intensity and interest. The first two of these questions will give the sermon intensity or passion. Without passion, the first two questions will arrive at the listener’s ears as a drone of no importance. The final question is the issue of relevance. Until this last question is answered, sermons inevitably degenerate to boredom because to the hearers such sermons seem to contain no information they need, nor can they apply what the preacher is saying to the “right-now” predicament of their lives (p. 62). Spiritual formation is not a destination to which we arrive but a hunger of heart we long to satisfy. I believe preachers have lost a great deal of credibility in the ministry because they project that they are living in a spiritually satisfied state rather than living in a wilderness of hunger for closer intimacy with Christ (p. 75). Without application there is no sermon. Application is what gets the Sermon off the Mount, and down in the valley where the toilers live out their days. Once people know what the Bible says, their next questions are: So what? How to? Where do I start? Sermons must take the information they dispense and tell the church what to do with it (p. 79). The sermon’s thesis: God expects obedience in every aspect of what he asks of us. How does the thesis relate to the text: The text is an example of how we can stray from honoring God’s commands and therefore dishonor God’s expectations. What is the sermon’s task (its application): This sermon exists to call people from a lackadaisical or disobedient lifestyle back to a walk of faith. The theme may be contemporized in this way: In the current secularized culture, how does the believer practice godly obedience in the marketplace, classroom, or the arts? (pp. 105-106). The thesis tells what the sermon is about and what it set out to do. But the motif is a kind of rhetorical call that keeps the sermon on track. Motifs are best when they are simple, short, and somewhat dramatic (p. 108). Propositions give you the information you need to build a life on, and stories motivate you to want to build such a life (p. 134). So sermons are remembered only if they contain enough pictures to be stored (p. 145). Storytelling is a great teacher for two reasons. First, it keeps the audience listening so they can learn. Second, it is easier to remember once the sermon is over (pp. 147-148). Sermons should say one thing (p. 179). I'd gives this book a 3.5 out of 5. I thought the part about including a sermon motif --which is repeated throughout the sermon--was helpful.